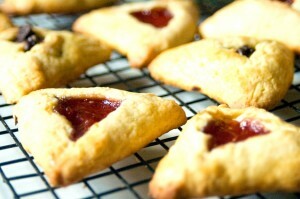 This past Saturday night began the Jewish holiday of Purim. Since Saturday was also the Sabbath, after morning services and lunch at our synagogue, we had games for the kids, crafts, a class on the book of Esther, a Jewish folk dancing class, pizza. Then we had evening services, followed by reading the story of Esther. This year, the kids also did an “Esther Reloaded” Purim play, parodied on Star Wars. Lots of laughs. It’s tradition in Jewish synagogues to dress up in costumes on Purim, and we had plenty of them. The Little One dressed up as a cat. One boy was Indiana Jones. And one of my friends was a bar of ivory soap. But I think the best Purim costumes I ever saw still go to D and his wife S, back when S was still pregnant with their little boy. She came as an oven, with a loaf of bread baking inside. (A “bun” in the oven, get it?) And he was the chef. Ba dum bum. We also had lots of Hamentashen, filled cookies folded in the shape of a three-cornered hat, such as that which Haman is said to have worn. In the story of Esther, Haman told Xerxes that the Jews were a terrorist threat and persuaded him have all the Jewish people in the land executed, before they caused national chaos. Haman did this because—quite frankly—a certain Jew ticked him off, and so naturally he resorted to mass genocide. It’s also tradition, during the reading of the story, every time Haman’s name is mentioned, to shout “BOOOO!” and spin noise-makers or blast horns or whatever you can, just in case you weren’t clear on what we really think of him. What Haman didn’t know, however, is that Xerxes’s beloved queen, Esther, just happened to be Jewish, and the man who had ticked Haman off just happened to be Esther’s cousin and adopted father. (Oops.) And so when Esther intervened, boy did the fit hit the shan. I can just imagine that moment, in the queen’s banquet room, food and drink aplenty, servants in attendance, the king and queen reclining in their royal robes and jewelry, and Haman at his place of honor beside the king, enjoying a cup of wine with the royal family, feeling pretty good about himself, because only him, the most important advisor to the king, did Esther invite as an honored guest to this private banquet. At this point, Xerxes is wondering what she could possibly be talking about. “Grant me my life?” This must be a metaphor. “Spare my people?” Which people? Has someone threatened her? Who? Esther turns her gaze to Haman, and slowly it dawns on the villain what he has done. Without a word, Xerxes stands and storms out of the room. He paces the palace garden for hours, trying to calm himself, trying to analyze the situation. He figures out that—unknown to him—Esther must be of Jewish ancestry, and that they are to be murdered, and that Haman had lied to him, because she and her family are clearly not of the evil, dangerous sort that Haman had described. But what can he do? He has already issued the order for their annihilation, and it can’t be undone. And now, for the second time in recent years, he is regretting one of his own edicts. Reflecting back, he acutely realizes that Haman was loyal to him only as a means to personal advancement. Xerxes always knew this was so, but it never bothered him so much before, because almost everyone honored him either out of ambition or out of fear. But that’s what made Esther and her family so different; they supported him not out of fear or ambition, but out of respect. Haman’s ambition never bothered Xerxes before, because it never before hit quite so close to home. He returns to see Haman throwing himself at Queen Esther, on her couch, his hands grasping at her, pleading for pity, clearly not caring about the indignity. Haman did not live too much longer after that. He was dragged by armed guards, sobbing and pitiful, stripped of rank, a nothing, to be hanged on the very gallows that he himself had built on which to kill one of Esther’s own relatives. But we have acted on personal offense, and have rationalized hating others. We have disparaged good men. We have lashed out in righteous indignation at other human beings, regardless of whether or not they deserved it. We have failed to show mercy, because we didn’t see how it could help us. We’ve called people names, and out of fear have fought them as though they were enemies. We do this in our personal lives as well as our political lives. Maybe Esther is also a story about the value of mercy. Not only mercy that we show to others—because if Haman had shown mercy, he ultimately would not have been executed. But also the mercy that God shows to us, because God no longer demands justice from us, but bestows His grace.